It’s Back to School Time Already! Preparing to take the kids back to school in the fall is one of the most tiring and troublesome experiences a parent can go through. There are so many little things to accomplish, such as buying new outfits, textbooks, backpacks, general school supplies, and reorganizing schedules around work and everyday life. Most kids will not be ready and will simply not want to offer a helping hand with all of the tasks that need to be completed by the first day of school. 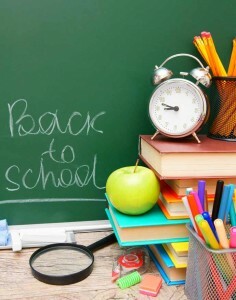 You should begin saving a bit of extra money ahead of time for the purchase of various school supplies. Most schools don’t send home a list of what is needed, such as the books, notebooks, and pencils, until it is nearly time to return. This can be troublesome and downright headache-inducing for most parents. The best option is to put aside a bit of money each month during the summer so when the time comes you already have the funds required to take the kids shopping. This is especially important for those parents who have more than one child in their home heading back to school. Some schools, especially middle and high schools, tend to have different starting times. You must balance your time between dropping off your child before the bell rings and making it to work on-time each day. This can be a bit of a hassle at first, but once you really get into the swing of things, it should be much easier. Heading back to school does not need to give you the headache that most people associate it with. Take a step back, take a quick breath, and write down exactly what needs to be done. This helpful advice is brought to you by Heidler, Inc. in Annapolis, MD. For plumbing services call us at (410) 268-7191.